Consult with instructor for choice of multiple PDF handouts, including Loyd #20, and also for optional automatic data acquisition with motion detector and LoggerPro software. 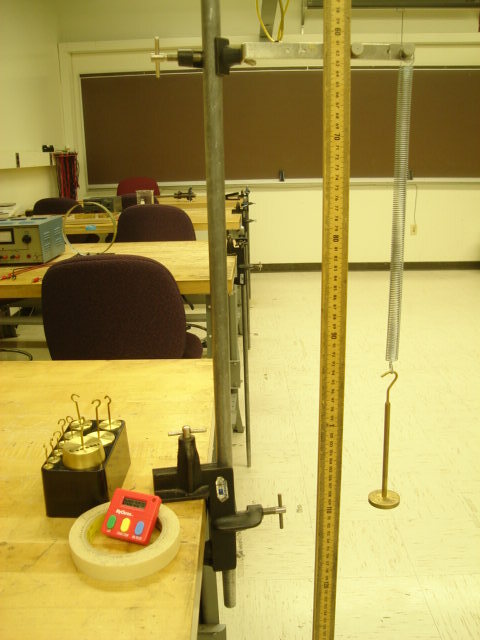 In this experiment, the students will both directly and indirectly determine the spring constant k of a spring and compare the two values. They will also determine that the amplitude of the spring is independent of the period of the spring. This lab requires laptops. The computer cart containing the laptops can be wheeled by faculty into the lab room. Make sure that there are enough slotted masses in the back of the room for all students. Make sure that the room has plenty of paper. Item modified on 2017-09-01 16:49:21 by andersone1.